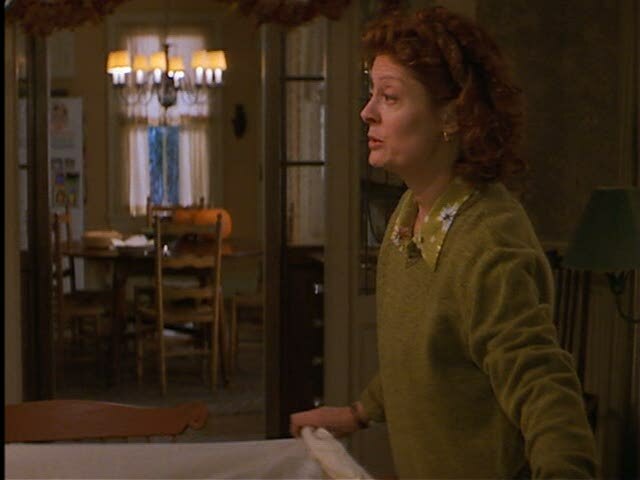 In the 1998 movie Stepmom, Susan Sarandon and Ed Harris played Jackie and Luke, a divorced couple with two children, Anna and Ben. Luke is dating Isabel, a young and successful photographer (Julia Roberts), and the kids don’t like it. 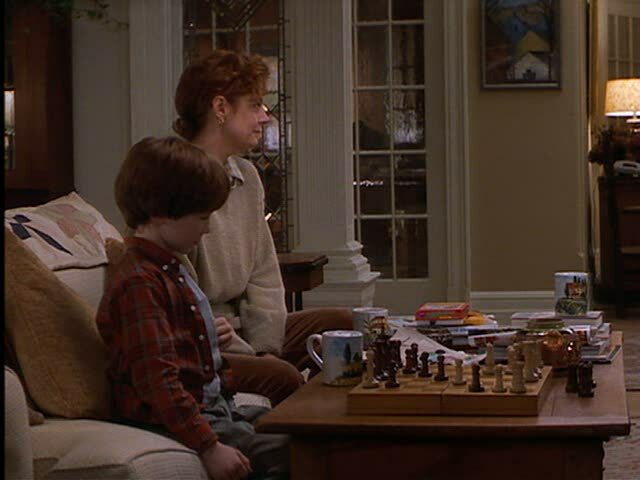 Isabel doesn’t much like playing the surrogate-mother role when the kids are staying with them in Luke’s loft, either. But they all have to learn to get along and become a family when Jackie is diagnosed with terminal cancer. 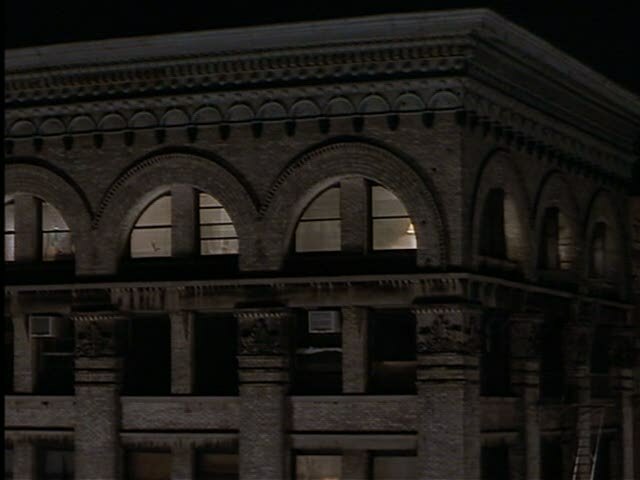 Luke’s loft windows at the top of his apartment building. 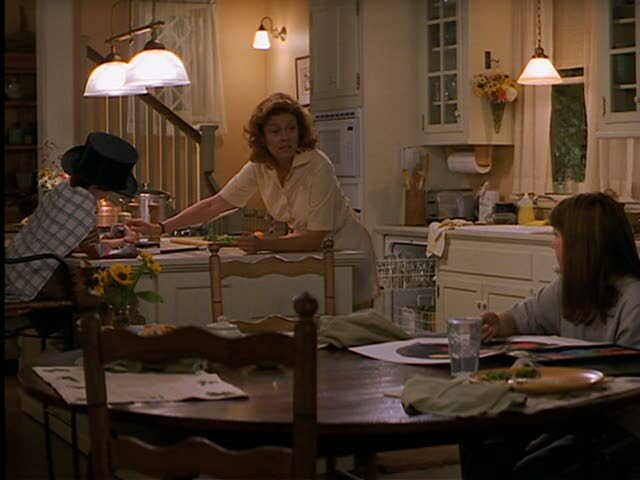 The kitchen in Luke’s loft is spare, modern, and open. Luke’s downtown apartment is a loft. In this fleeting shot, you could see the upstairs railing, open to the kitchen and living room below. 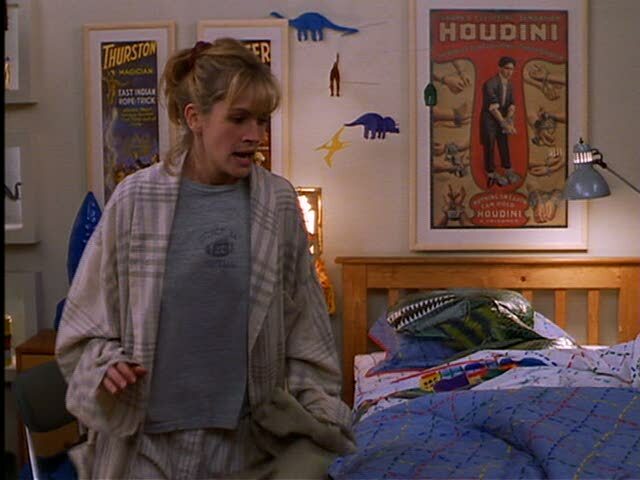 Ben’s room in his dad’s apartment. For some reason, Isabel, Luke’s girlfriend, is left to take care of the kids an awful lot. And she’s not very good at it. Isabel was trying to get Ben ready for school. Bad picture, but it shows the arched windows in the background. Looking from the kitchen into the adjoining living room. Luke and Isabel in his kitchen. It’s dark, but this is the view of the loft’s living room from the upstairs hallway. And now to Jackie’s house, which is what I know you really want to see! 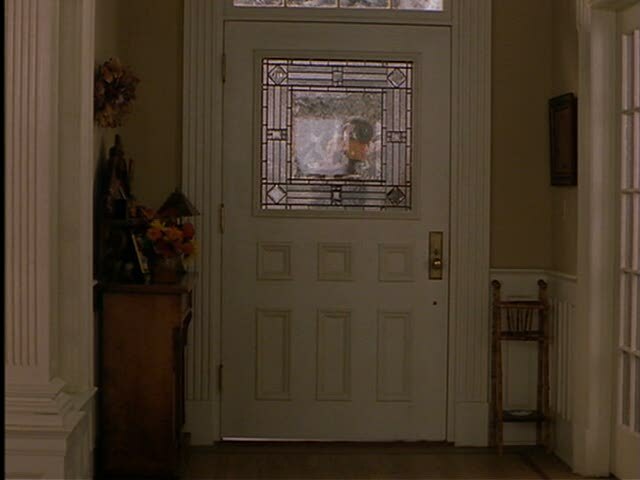 The front door of Jackie’s house (from the inside). Jackie’s front hall and staircase. Another view of Jackie’s kitchen, which doesn’t seem outdated 10 years later. Another view of Jackie’s kitchen, with the hutch. Jackie’s kitchen has a back staircase coming down into it. A view from the dining room into the next room. 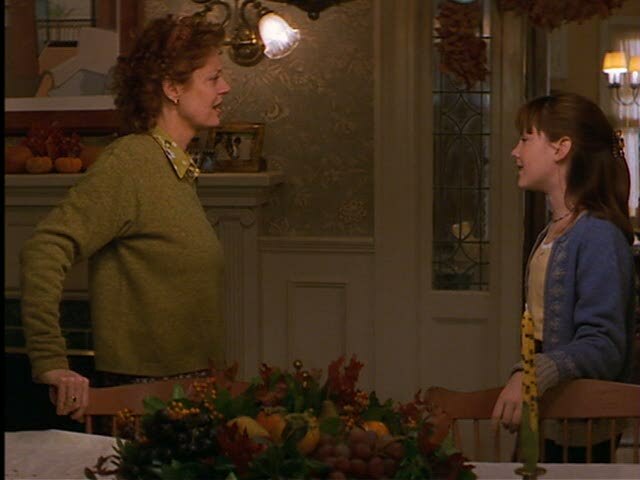 Anna helps her mom set the table in the dining room. 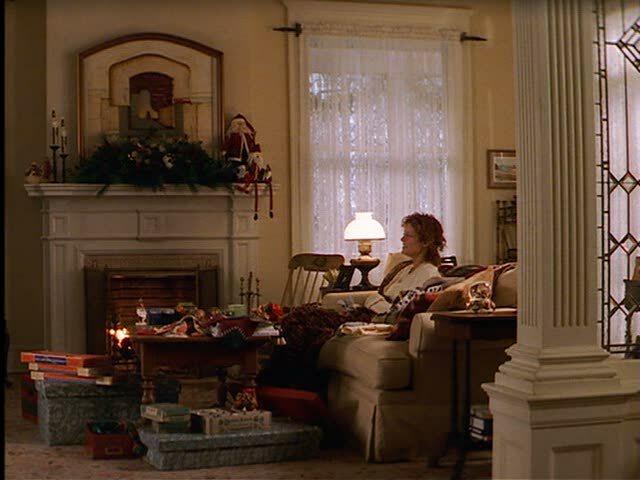 In this shot you can see they have a fireplace in the room. An armchair in the corner of Jackie’s living room. Jackie and Ben in her living room. Isabel coming down Jackie’s staircase. 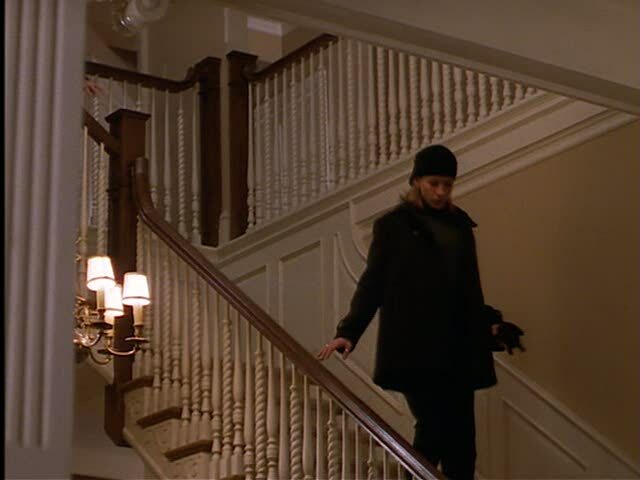 As Ben goes upstairs, we get a glimpse of the upstairs hallway. Ben at the upstairs landing. 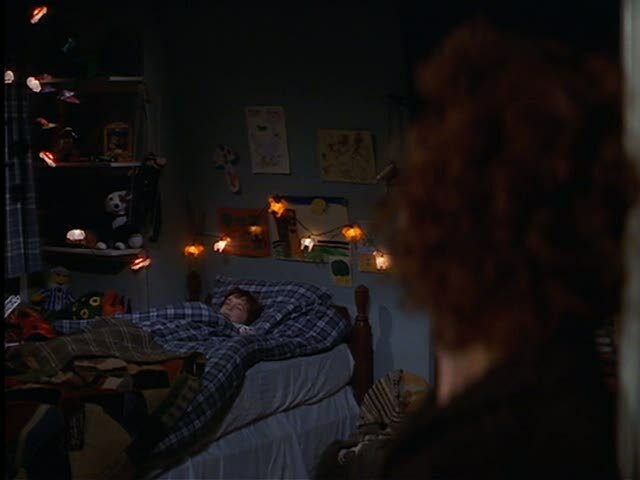 Ben’s room in his mom’s house. 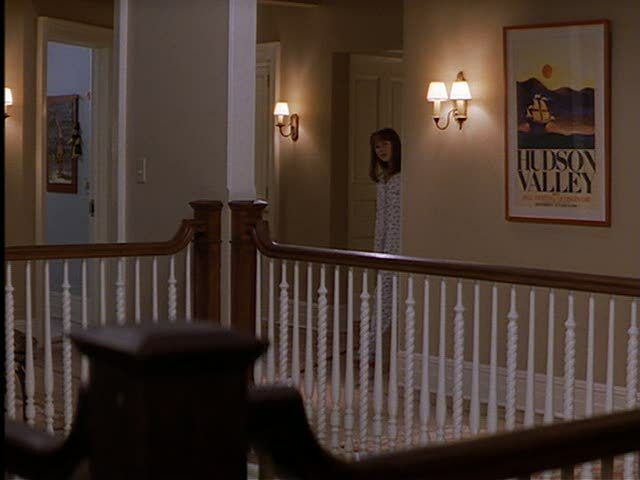 Upstairs hallway of Jackie’s house (with Anna peeking around the corner). Love this little nook under the arch on the upstairs landing. 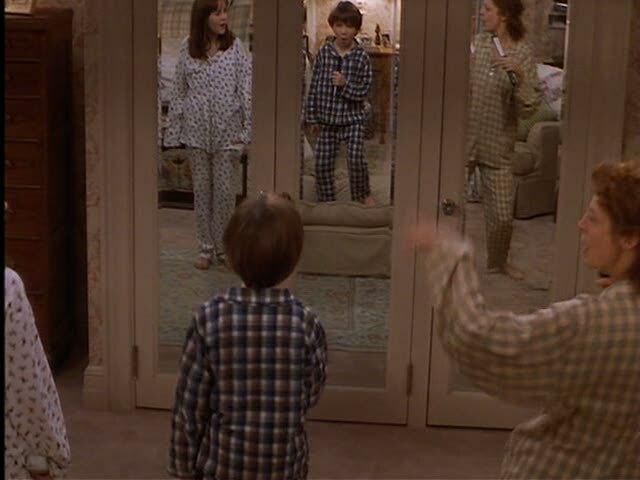 As Ben and Anna lipsync to some Motown music with their mom, you get a glimpse of the mirrored closet doors in her bedroom. 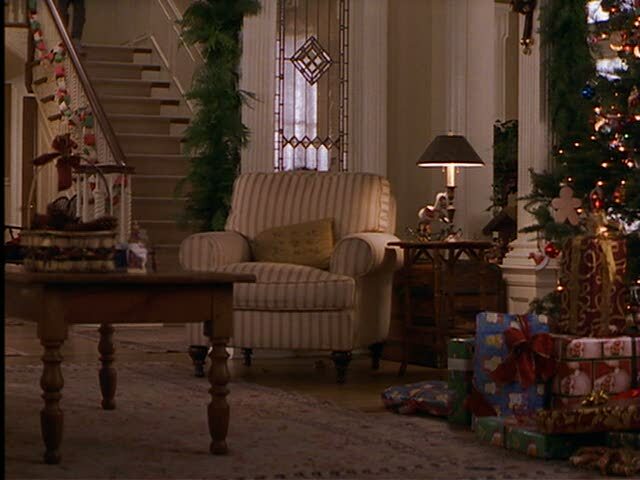 Ben goes into his mom Jackie’s bedroom on Christmas morning. Looking down the stairs in Jackie’s house. Of course a house like this would have a tire swing! Isabel and Jackie hashing things out in Jackie’s scenic yard. 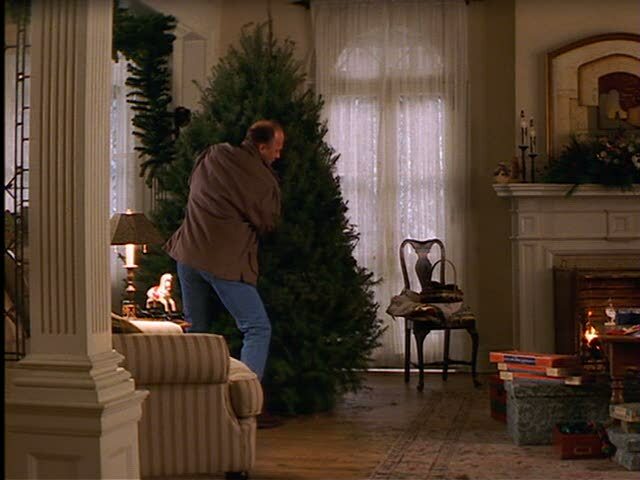 Luke brings Jackie a Christmas tree. Jackie’s living room and hearth. 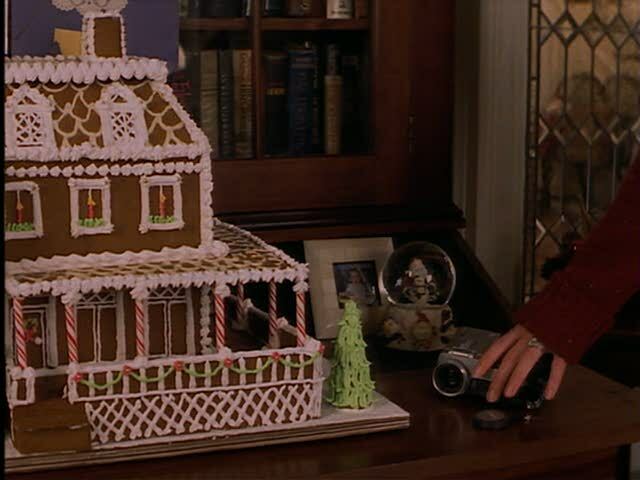 You only get a quick glimpse of it, but this seems to be a gingerbread house made to look like Jackie’s! 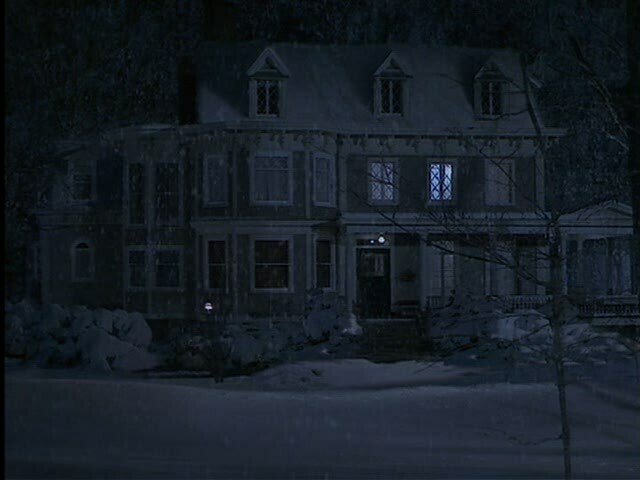 A snowy night at the house. Jackie, on her last Christmas, tells her daughter Anna, “You have made my life so wonderful.” Pass the tissues! 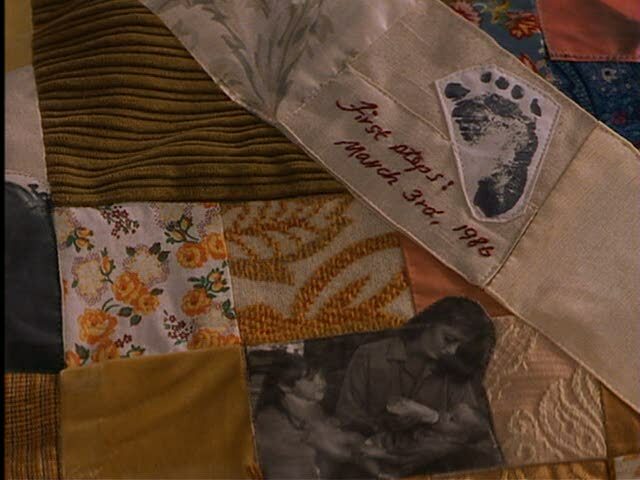 Close-up of the quilt Jackie made for Anna for Christmas, with photos and memorabilia stitched in. 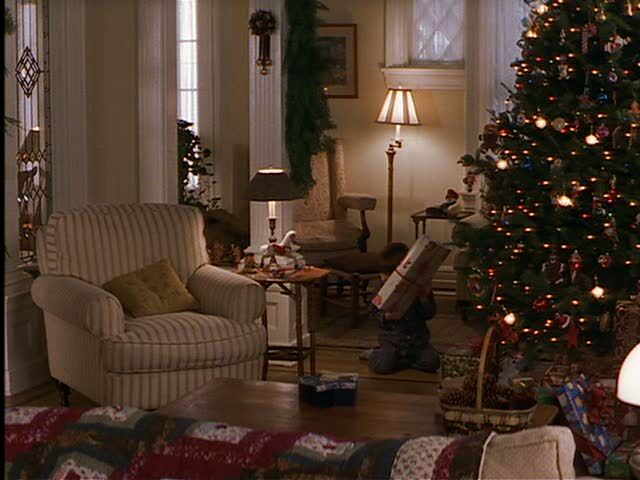 The tree on Christmas morning in Jackie’s house. 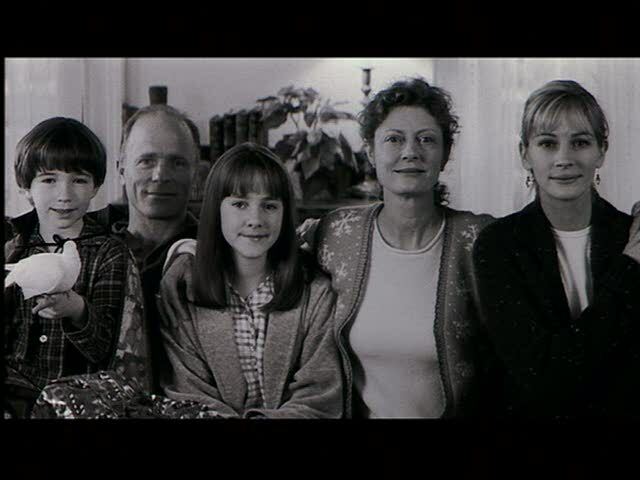 Final shot in the film of the photo Isabel takes of the family on Christmas day. 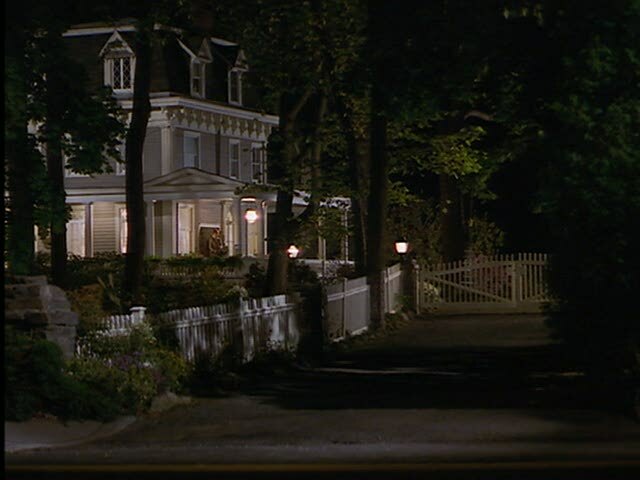 According to the film’s production notes, the home’s exterior was filmed in Nyack, New York, but all the interiors were built on a soundstage. *JANUARY 2011 UPDATE: The house is now on the market. More photos and information here. 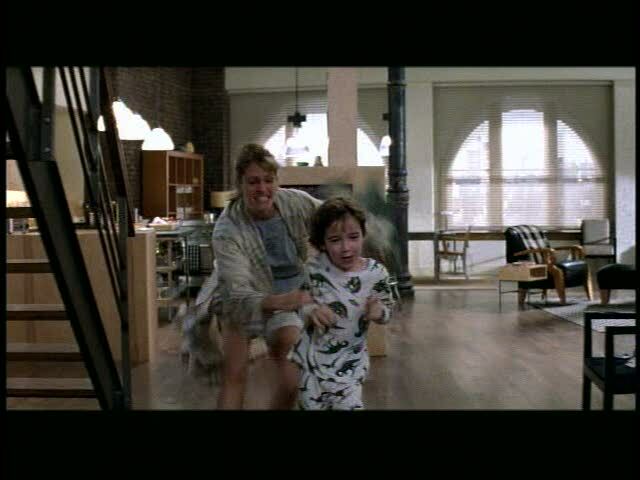 Visit my TV/Movie Houses page to see all of the others I’ve featured, from The Family Stone to Home Alone. Hi Julia. Thank you so much for showing so many photographs of this beautiful home. The story is so poignant and the setting is just stunning. There are so many rooms and areas of this home to love that I can’t pick a favorite! What a great way to wish everyone a Merry Christmas! Thank you for all the photos. Merry Christmas to you & your family! I love this house! I always admired it so much when watching the movie. 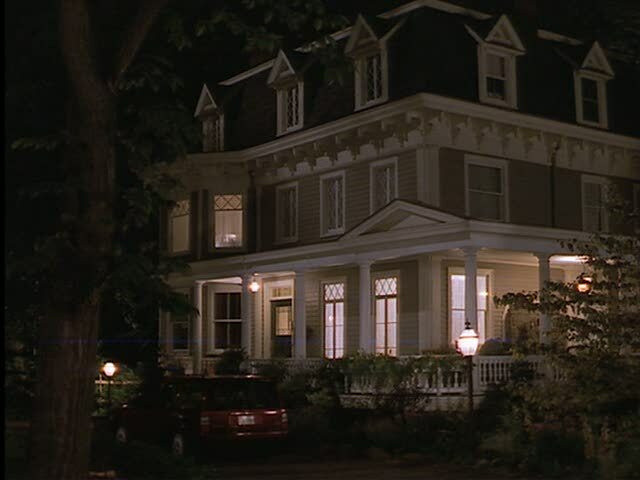 I remember getting a little distracted trying to analyze the house, I think it is so beautiful! Julia, I can’t even get through the photos without crying. It’s a beautiful house, but that was such a sad movie. 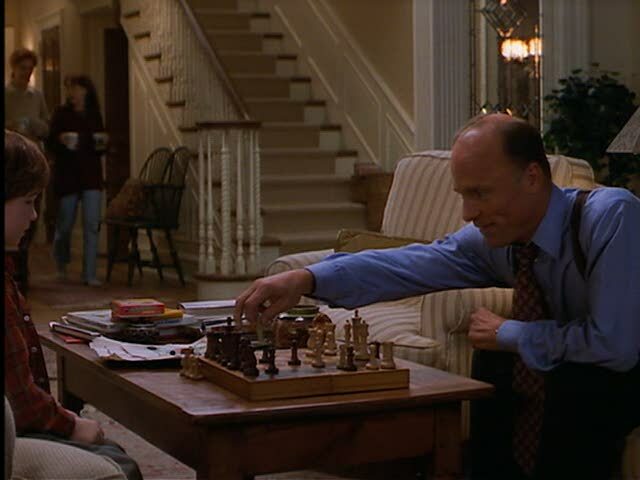 Great movie, great actors, GREAT HOUSE (no offense to Julia or Susan of course!). I loved seeing so many of these wonderful pictures without having to pause the dvd player! Thanks for sharing so many great images. Can I ask where you were able to find them all? 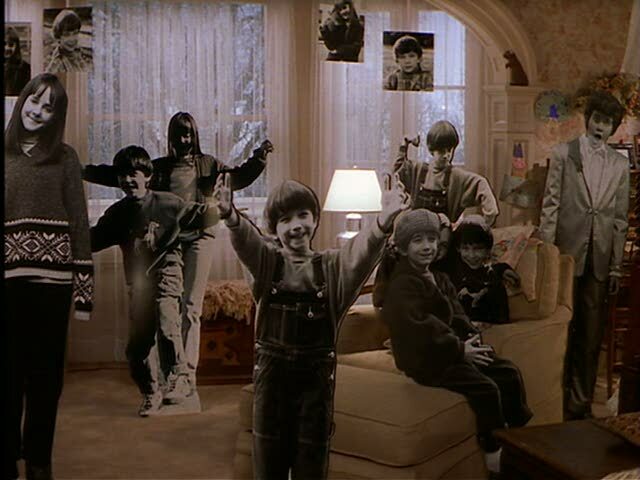 And yes, I too find the multiple cardboard cutouts a little strange… though I think I was too busy focusing on the architectural details in the background to notice them the first time I watched it! It’s a beautiful house! Thanks for showing it to us! It doesn’t look as out of date as you would think! wow! that house is beautiful and looks comfortable. Thank you for sharing it with us. PS: I like that kitchen. I can tell you are a great fan of the movie…as well as the home. Thanks so much for sharing something that means so much to you. I could all day looking at homes. It is definitely addictive and something I never tire of. Merry Christmas and a Happy New Year to you. Nice house – inside and out ! I love it! It’s all so beautiful. I love how it’s a HUGE house, but looks cozy. 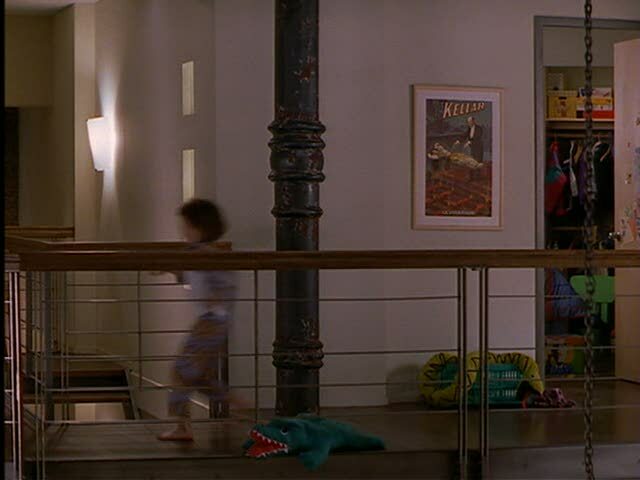 Actually, I really like Luke’s loft too. If I had a loft in the city (that city being Chicago) I’d want a loft like that. I loved this movie, but it depressed me horribly. I am happy to get another glimpse inside the house without having to watch it again. Thanks Julia!! Have a wonderful Christmas with your family!! That house is AMAZING! The movie is so sad I almost started crying just reading the blog! LOL. Yikes. But, Oh, that house! LUV IT! My eyes are teary as I write. I heart this house. The details, the balcony upstairs, the nooks & crannies, the kitchen….all of it. Thanks for putting yourself through that just to show us the pictures. Have a wonderful Christmas. Oh…I remember how sad that movie was! 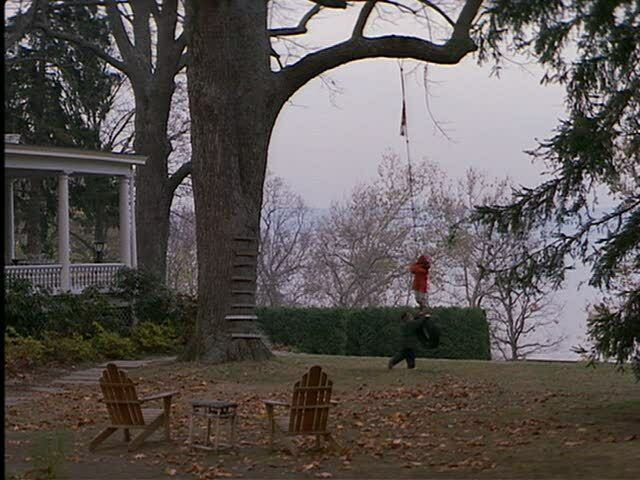 I also remember the house, 10 years ago we had just moved to FL from NY and our house was soo similar (the inside and the yard…tire swing…)I rember watching the movie and crying because of the plot, but ALSO because i sooo missed our old home! Have a WONDERFUL Christmas Julia…You and all of your beautiful homes have brought me such eye candy and JOY! Thank you! Love these pics, Julia! It has been that long since I’ve seen this movie too & it was a tear-jerker. but, oh…that house! Gorgeous, it truly has stood the test of 10 years time. Classic for sure. I’m amazed that you took all these pics while watching, LOL! The clarity of your pictures amazes me. When I have taken pictures of my tv in the past it’s always so fuzzy in the picture. You must have a nice tv! I need to look at the “stepmom” house and the “family stone” house next to each other. They look so similar to me! Didn’t like the movie because it was so sad, but I do love these photos. The outside (real house) is beautiful. Was this not just the BEST HOUSE! Oh my gosh. I still drool thinking about it. Not to mention I loved the movie. U’z a smaht one, Miss Julie. That is some neat software you have! 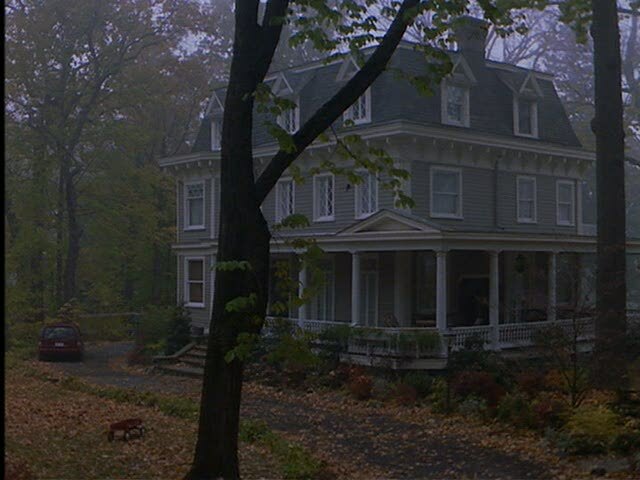 I hated the movie because it was so sad, but love the house. Another beauty!! 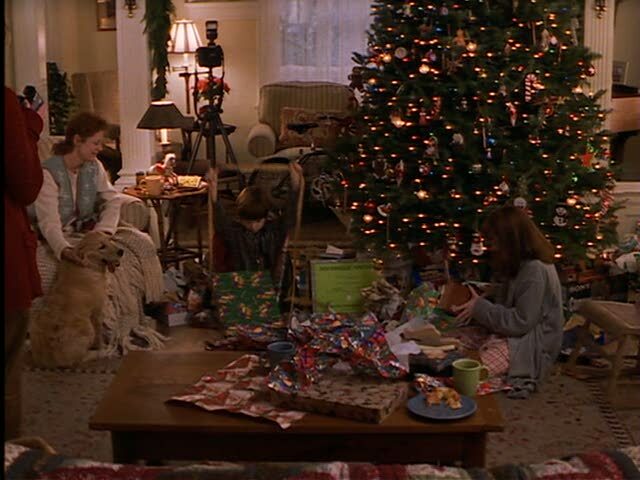 Love this house and the film..
Merry Christmas dear Julia…I send love and many warm hugs to you and your family. Oh man, this movie was a tear-jerker for sure! But I did love her house. That kitchen is so big and spacious! Good house tour Julia. Have a very special Christmas! I love, love, love the kitchen. I will have a house one day with a staircase from the second floor down to the kitchen. 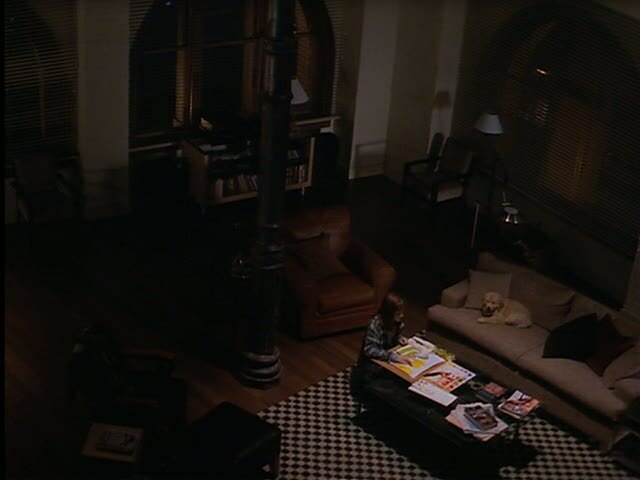 Please keep on this way, movie interiors, are an incredible source of pleasure. Oh my goodness that house is just gorgeous!! I haven’t actually seen the movie and didn’t know it had a teary ending… so now I have to know what happens at the end!!! Because I probably won’t see it. Anyway, I just stopped by to say Merry Christmas! Hope you have a great holiday. 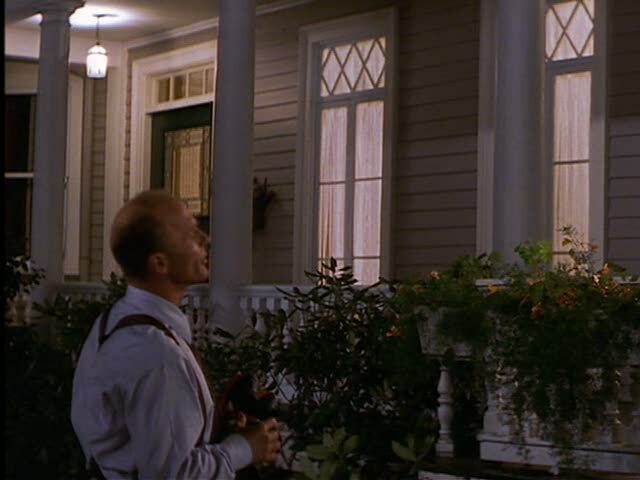 Oh Julia, such a wonderful movie… I cry every time I watch it – the scene where they slip away for a horse ride gets me every time too. Thank you so much for sharing these photos – one of my favorite movie houses too. I hope you have a beautiful Christmas and I look forward to your inspiration and wonderful blog in 2009. Thank you for everything that you share and do! Julia, I love, love, love that house. It’s gorgeous yet homey. 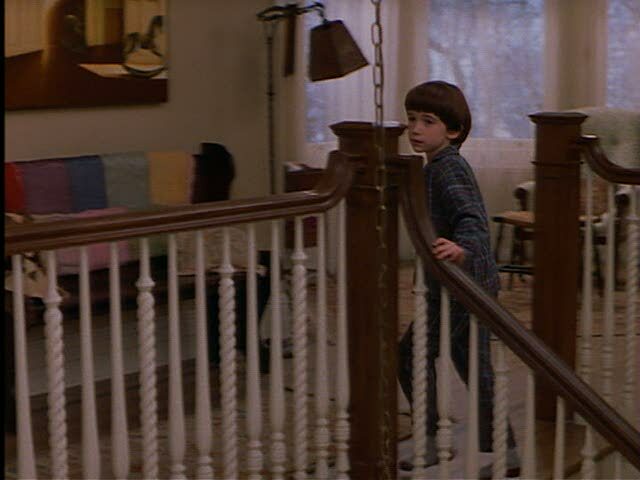 I especially love those staircase spindles. I hope you and your family have a very Merry Christmas and safe travels. It’s been fun getting to know you this year. Thanks for all you do through your blog. Happy wishes for lots of fun house tours in 2009! 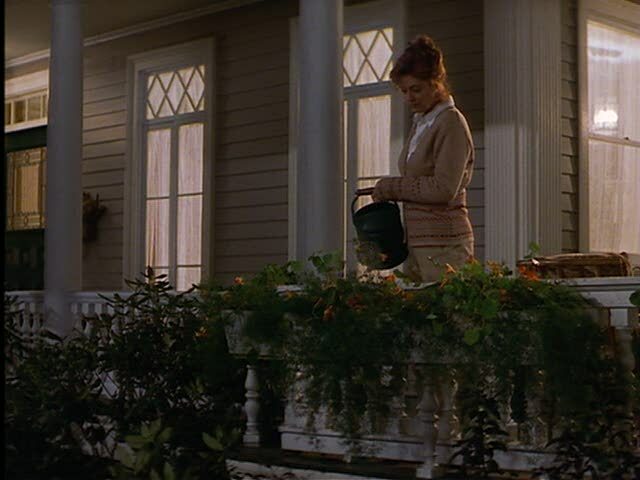 I would love to see a tour of the house from “Something’s Gotta Give”…that beach house is so beautiful. 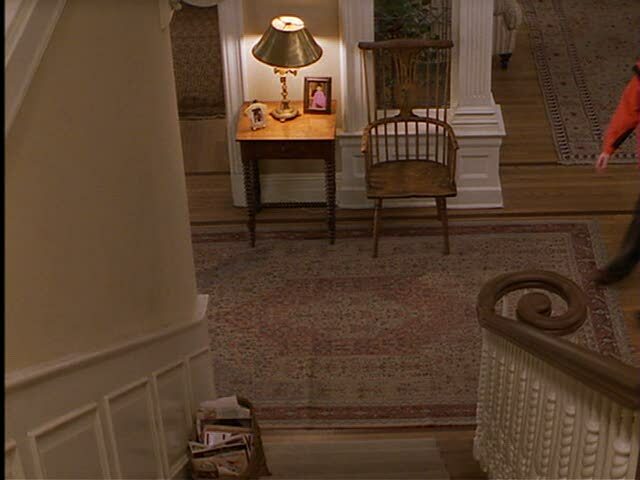 I’ve watched that movie many times just to enjoy the interiors of the house. Talk about a DREAM kitchen! Hope you had a merry…And thanks for always making my days bright! AAAHHHH!! I love this house. I echo laura @ shorehouse – Joy to the World! I love this movie but haven’t seen it in forever either! I’m so sad the interior isn’t “real” — it’s beautiful! How about the house in Mr. Blandings Builds his Dream House? That house is impeccable. All of it. Kudos to the designers for sure. I’m having a nook craving. Okay. I started crying just looking at the PHOTOS from the movie!! 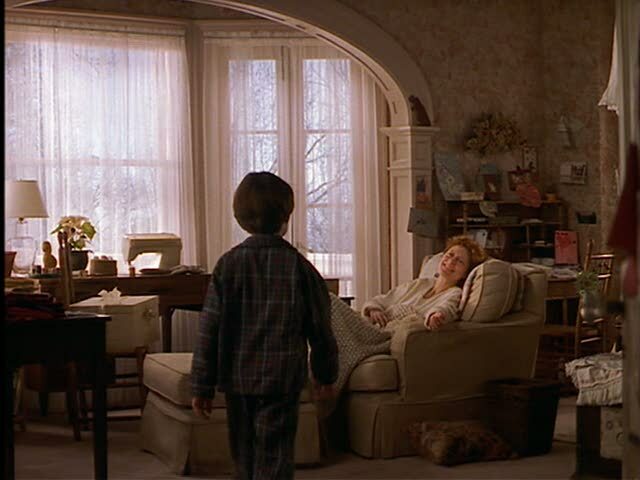 This movie always makes me cry like a crazy person. LOVE that house too! oh, how i loved that house! For someone like me who is relatively new to the blogging world, this is a fantastic post. It is wonderful to see all of the things I missed in 2008 before 2009 rolls around. Have a wonderful New Years Julia! I look forward to not missing your top 10 in 2009. 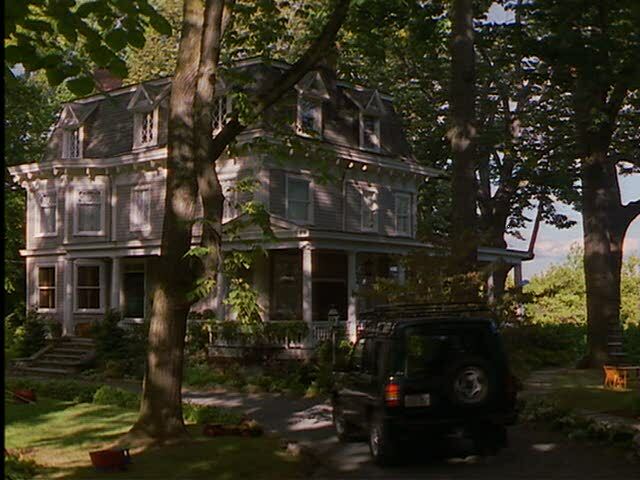 The house in “Practical Magic” is great too! They did an article in an old “Victoria” Magazine on how they built the exterior of the house on a lot located in the San Juan Islands (Washington State) and tore it down afterwards (!). The interiors were pure Hollywood magic. The kitchen and greenhouse in this picture are truly wonderful. 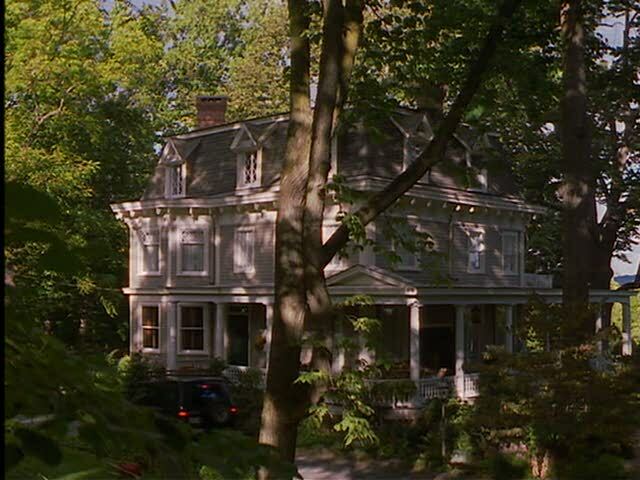 “One True Thing”, with Meryl Streep (NEAT house in another Streep movie, “Before and After” too) and Renee Zellweger has a wonderful family home featured. I could move into this house tomorrow! “Sleeping with the Enemy” w/Julia Roberts shows her house she rents after she flees her previous life. I read this old house was found in South Carolina. Love the house! 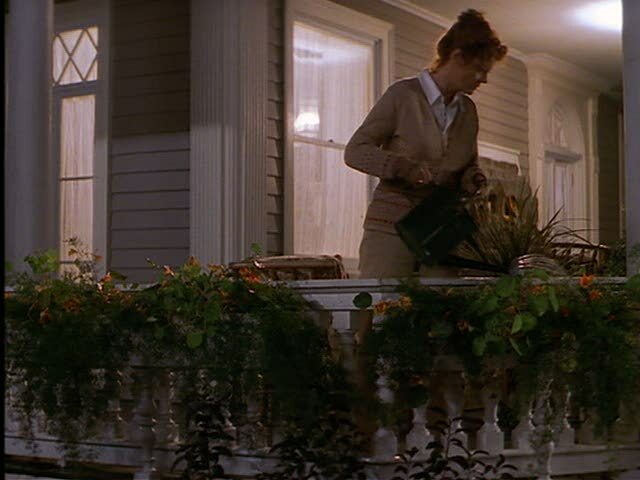 And one of my favorite films, “Baby Boom”, has the farm she buys to escape New York, located in Vermont. And speaking of Vermont, another film, “Funny Farm” (another fav) features a country home on a pond (sigh). And finally – near the end of an old film, “Hope and Glory”, the riverside cottage of the grandparents . . magical. Just a few of my movie houses . .
“Hooked on Houses” is just so inspirational. How Julia does this all, without assistants, I’ll never know. But a HUGE THANK YOU from all of us. 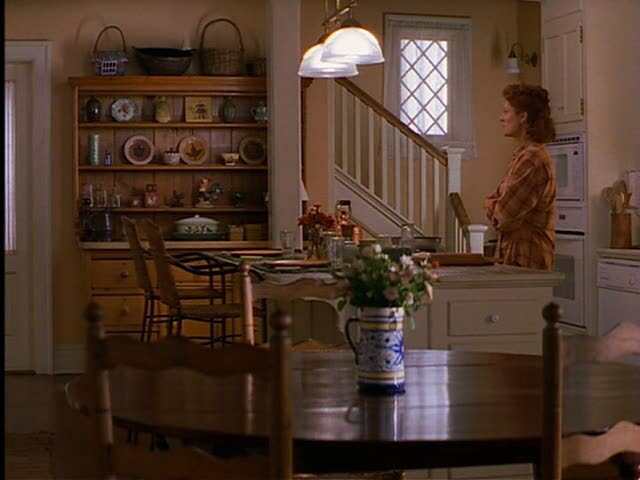 I loved seeing these pictures and remember drooling over the house while sobbing during the movie. I’ve seen the movie a few times and it still gets to me and makes me cry. The house (set) is wonderful – a true dream home. I just enjoyed the Stepmom house.Wow, that is my ultimate dream house, I wouldn’t change one thing.It makes my heart ache, but in a good way. Thank you Julia, for this wonderful website. It really brings me joy. Oh, thank you, thank you! I have been looking for pics of this house everywhere… it’s my favorite! 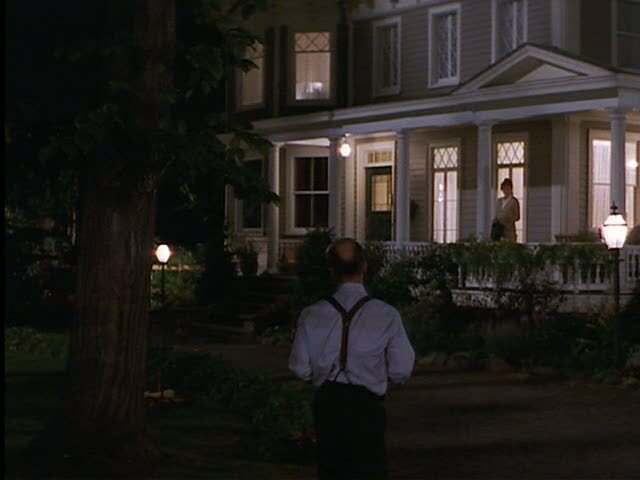 I also love the house on One True Thing. Thanks for your creative website… I just learned about it from a friend, and I will definitely be reading it often! 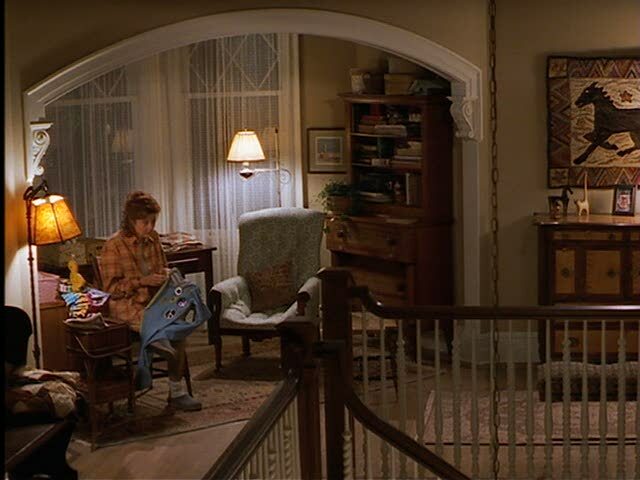 Jodi again.I love the townhouse in San Francisco in the movie Mrs Doubtfire with Robin Wiliams. 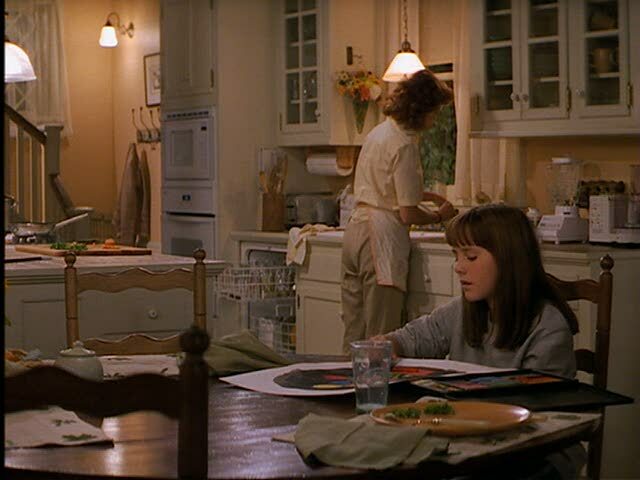 Sally Field’s character is a designer,its really traditional, but that’s my fave for fantasy/dreamhouse types of houses. It has a beautiful entry and staircase. The exterior is pretty, too. Thanks again for this fun place to visit…….. Wondering what type of house this is? Victorian is my guess? To Matthew (who asked about this home’s address at least a year ago), I don’t know the exact address, but the house is on the east side of North Broadway in NYack. 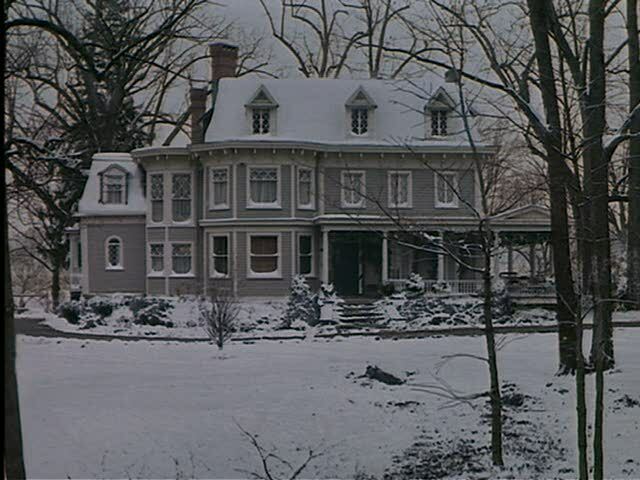 It’s located not too far north of Pretty Penny, the old Helen Hayes (and later Rosie O’Donell) house. I think the diector Jonathan Demme still lives in that same neighborhood too. Hello! I’m from menorca, Spain. 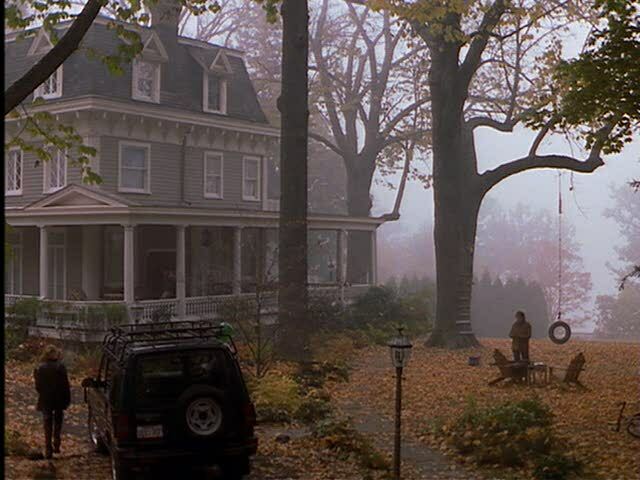 I wanted to tell you so I LOVE this house since I was 16 years old, when I saw the film. 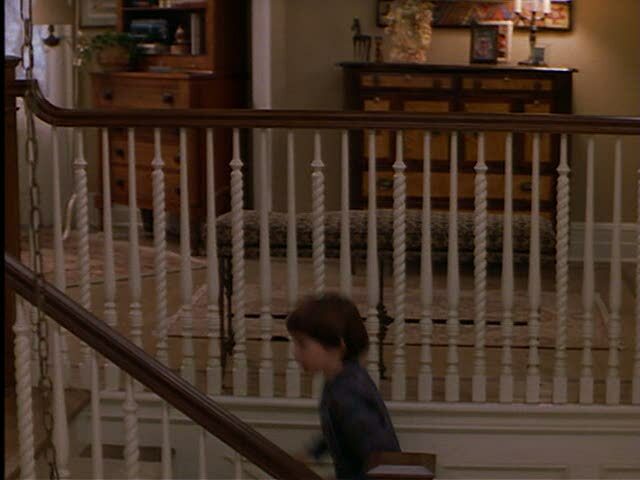 I have seen “Stepmom” so many times just for see the house. I would like to know where is it. And I have to give congratulations for the decorator, I would like to know him or her. Good job! Excuse me for my english and thanks for the images I have all in my mind. I have drawn a fairly close floorplan to the stepmom house but I cant find a way to submitt it, Please tell me how !!! I have seen this movie at least 30 times. Every time I watch it, I try to figure out if the interior shots were really done on a soundstage. To me it seems to match the exterior of the house (when they enter in and etc.). Me and my wife are thinking about visiting the New England area for a Fall Vacation and I would love to see this house in person. Anyone else other than Ryan have more details on where this house is? I was just searching around on Google Maps and from the street view and satellite view, I think you can see where the house is. Type in 424 Broadway North Broadway Avenue and that should be the house on the right. Match up the driveway and the top view from the house using the satellite view and then the street view for the entrance to the house form the street. The white fence isn’t there, but that may have very well been something they put in just for the movie. Thoughts on the possibility? 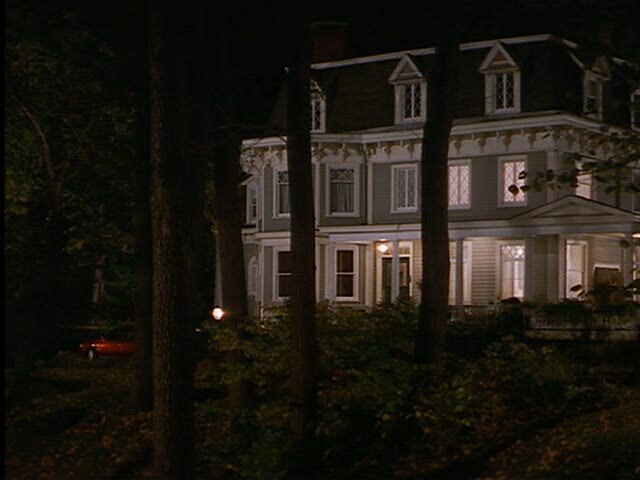 That was a really good guess, but actually the stepmom house is located near: 503 N Broadway, Nyack, NY 10960. You can see a birdseye view of it here: https://www.bing.com/maps/v=2&cp=qvhxt58v6896&scene=2236820&lvl=2&sty=b. I came upon the house one day while searching for it. I got all mixed up and you were right. I was looking at the address in birdseye so it took me to a totally different house, the wrong one across the street from the stepmom house. 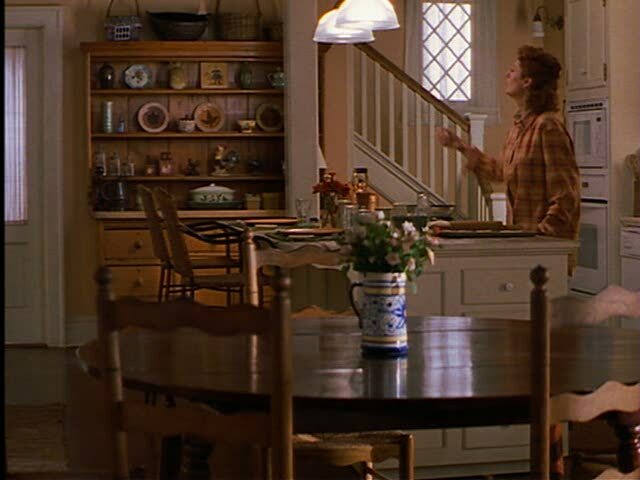 If you would like to see the stepmom house in birdseye, you can try the new link here: https://www.bing.com/maps/?v=2&cp=qvhwzd8v68nb&scene=2236820&lvl=2&sty=b&where1=425%20N%20Broadway%2C%20Nyack%2C%20NY%2010960-1211. Since the others didn’t work. If that doesn’t work, go to bing.com/maps and search for the house with this address: 425 N Broadway, Nyack, NY 10960. Under aerial, click birdseye and look at the house in the East direction. I love this house. This would be one of the houses I would live in, if it were real and I had lots of money. Just caught the last half hour of this movie (I remember going to the movies to see it), and I’m always transfixed by it, not only by the actors, who are favorites, but the house!! Makes me want to be a stay-at-home mom like Jackie! We can dream. 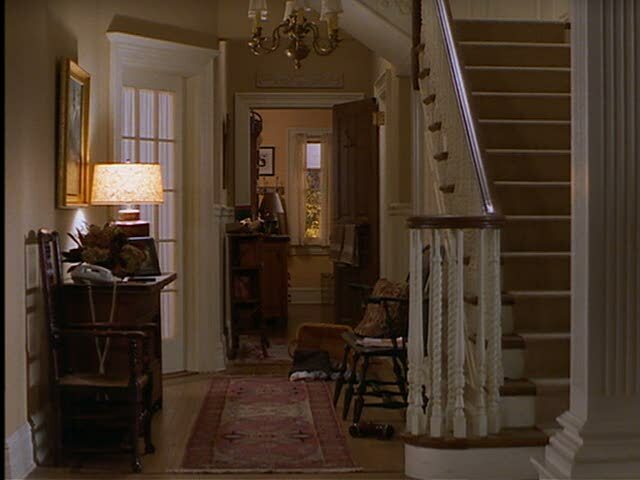 This is my dream house, especially the cozy nook near the stairway, as well as Jackie’s bedroom. It’s decorated exactly the same way I’m trying to do with my much smaller house. Plus, I love the autumn and winter, and it all looks so cozy and wonderful in this movie. I may have to buy it!! Thanks for the fabulous pictures. I have booked our airline tickets for a New England trip in October. Me and my wife are flying into Newark Airport and then driving a rental car up to Vermont and New Hampshire for a few days and then driving back down to NY to spend a few days seeing the Big Apple. I told my wife I’d like to stop by to see the Stepmom house on the way up to VT & NH since it’s on the way and the address is now confirmed. Would it be criminal to pull into the driveway, ring the doorbell, and ask to see the house inside and out? 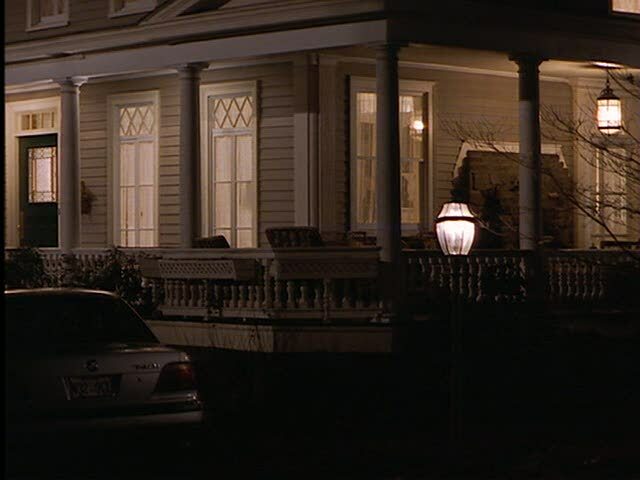 Did anyone else notice this house was the Inn in the Jennifer Aniston movie “The Bounty Hunter”? I’ll have to watch this movie now! Any screenshots? What I don’t get is the production notes said the interiors were all built on a sound stage but the living room in the Jennifer Aniston movie looks suspiciously similar to the living room in Step Mom. That’s amazing you found that link about the painting selected to be in the movie along with the house photo. Really? I haven’t gotten around to seeing the movie yet, but will definitely pay attention to that when I get around to seeing it. I guess there’s a chance the production notes were incorrect? Hopefully I can find out for myself in a month and a half!!! I could have died when I saw this blog, bc I’ve been obsessed with this house for years and years. I’ve always told my friends how much I love it, and I couldn’t believe someone else noticed it. Thanks for putting this together. 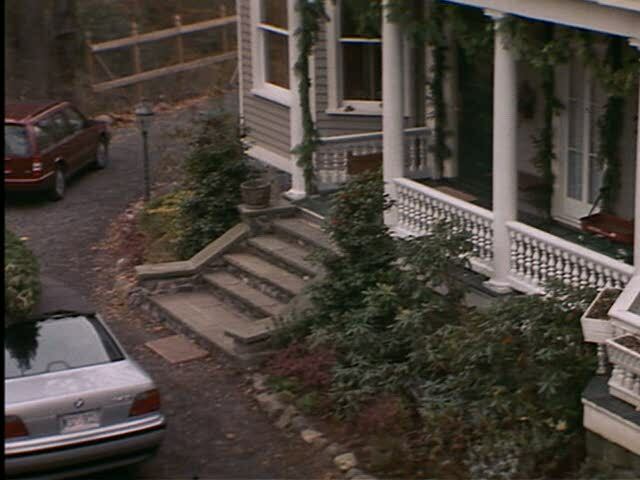 The movie “Bounty Hunter” was shot at he Stepmom House. The house was redecorated to look like a corny B&B. Visit the site and see the real thing! Thanks for posting the blog to the house, Patrice!!! They just don’t make them like this anymore. Just gorgeous. I like the movie, andi like the house to . Very nuce , and big. I LOVED this movie almost as much as I loved drooling over the houses! Loooooove this house! And this site! Now if only someone would do a set decorators site where I can look up things like paint colors, etc…. I love this house!! I am currently trying to put together a floor plan of my dream home, does anyone have a floor plan they have drawn out of this house or know where I can find one?? One important issue is that when you’re searching for a student loan you may find that you will need a cosigner. There are many conditions where this is true because you might discover that you do not use a past credit history so the loan provider will require that you’ve got someone cosign the borrowed funds for you. Thanks for your post.